In a recent post, blog friend JDB of Augenblick introduced the famous Maxfield Parrish painting ‘Daybreak’ and we looked at a 1984 record by Dali’s Car that borrowed it for the cover. Here are two further eighties album covers inspired by Parrish’s iconic painting. Bobby Womack was a husky-voiced singer who had a long and varied career that included working with Ray Charles, Aretha Franklin and, early in his career, Sam Cooke. Interestingly (and somewhat controversially), Womack married Cooke’s widow Barbara Campbell some three months after the soul legend’s death. That wasn’t the only tabloid incident in the singer’s life. In the 70s he was mates with Janis Joplin and the Rolling Stones and apparently enjoyed the rock and roll lifestyle to the hilt. Not so his brother, who was murdered by a jealous ex- in Bobby’s apartment. By the time of his 1985 LP So Many Rivers, Womack had cleaned up his act and had a hit with the album’s opening track, ‘I wish he didn’t trust me so much’. The album has a bright eighties sheen, with slick strings, smooth synthesisers and caramel backing vocals underlining the singer’s throaty vocals. It reminds me a tiny bit of Steve Winwood’s music from the same period. Except that the songs are not especially strong and are quite often overpowered by the slick production. Probably one for fans only. As for the cover, taking Parrish’s Daybreak as inspiration, it shows Bobby lounging on a balustrade over a checkerboard patio. For a man balancing on a narrow concrete ledge, he looks remarkably cool and relaxed. The acoustic guitar leaning against the pillar is a misleading—there’s nothing even remotely acoustic about this record. I guess you could describe the cover as saturated and over-produced, rather like the album itself. To conclude, I’ll simply observe that the notes on the back cover thank the Almighty but not Maxfield Parrish. The Moody Blues entered the awkward eighties with the surprisingly strong Long Distance Voyager (1981). The muted blue-tint throw-back cover of that album gave way to the Parrish mash-up of The Present (1983) which added a spaceship. If this implies the band had gone from the past straight to the future, then the title becomes a bit confusing. Still, The Present is a perfectly satisfactory listening experience for Moodies fans, despite being neither perfect nor particularly adventurous. Songwriting is shared between John Lodge, Justin Hayward and Ray Thomas, so we get big ballads, lush melodies and some ‘nature of the universe’ musings. The keyboards of Patrick Moraz fill out the sound skilfully—what else would you expect from the man who replaced Rick Wakeman in Yes?—and Hayward’s guitar steps forward competently (if rarely thrillingly). Some of the stronger songs are big mid-paced opener ‘Blue World’ (a reference to Maxfield Parrish blue, perhaps? ), the well-made rocker ‘Sitting at the wheel’ (which, oddly, evokes eighties ELO), Edge’s classic ‘Going nowhere’ (Moraz is terrific) and Thomas’s whimsical closer ‘Sorry’. I have to say that this album grew on me during the listening—what started out as a dismissive 5/10 migrated towards a solid 7/10. The painting is much more yellow than the original, perhaps hoping to suggest a golden age. But after eighteen years of Moody Blues records (at the time of release), it tends to make one think of autumn, spaceship notwithstanding. Yet it certainly has been an extended golden autumn for the venerable members of the Moody Blues. When the band formed in 1964, or even in their 1983 Present, who could possibly have imagined a future where the band would release an album entitled Days Of Future Passed Live in 2018? Now that’s longevity. Let’s complete this series with another glance at the Mayfield Parrish painting that provided the inspiration for the three album covers. Unless, of course, someone knows another album that uses Daybreak…? Could not find any covers using ‘Interlude’ either, though it would be a perfect choice for some Renaissance or early music, wouldn’t it? 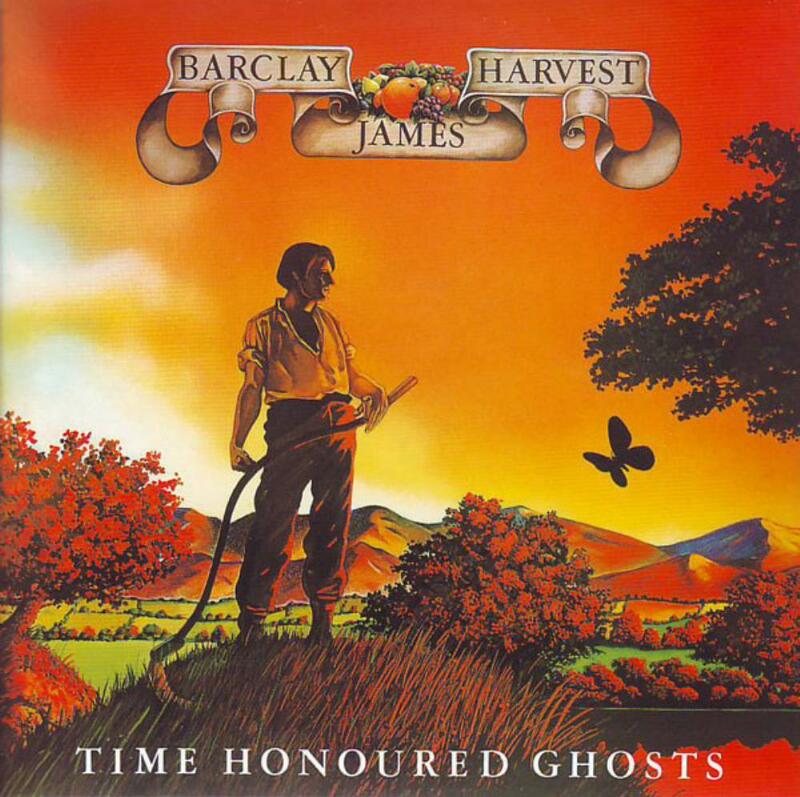 I did, however, clarify that the Barclay James Harvest album ‘Time Honoured Ghosts’ (below) adapted one of Parrish’s paintings, “Harvest”. Long Distance Voyager was a great comeback. The Present was good, too, but maybe they should have lavished a little more care on it. Still, a pretty good effort to have two strong albums in a row 15+ years after you started, eh? Womack is a fascinating chap. Incredible voice… and when he was actually on form with his writing he was really up there. Is it bad that I’ve never bothered with The Moody Blues? A compilation that can be obtained for a song sounds like the perfect introduction. I’ve seen some speculation that the background of the image on Elton John’s 1974 offering, Caribou, is inspired by Parrish. Enya has also tipped her hat to the man on one of her recordings. I really enjoyed these Daybreak postings; it’s interesting that three such disparate artists/groups appropriated the same image. Yes, the Enya one is certainly an homage, as they say. And I saw the Elton link too. The Barclay James Harvest cover in these comments is another appropriation. It’s been fun. Thank you very much for providing the spine of the posts with your introduction to Parrish and ‘Daybreak’. I think we can truly say that morning has now broken. Morning Has Broken…does that call for a post about Cat Stevens? (Was he ever popular Down Under?) An honor to collaborate with you; let’s do it again. Always glad to be of service, Bill. Could be a new slug line for the blog: We listen so you don’t have to. Also enjoyed hearing that the Parrish original also infiltrated your own music life. Neat. I know, thanks for unlocking that random memory for me. Always happy to discover new, random memories. Makes me feel vast and mysterious. Vast and mysterious, eh? Phew. I think the only time I get that sense is when I’m listening to Tangerine Dream’s ‘Zeit’ in the almost dark (an exercise I commend to you, by the way). Ah, I’ll make a note of that. Sounds pixie dust-like. Not really. More galactic paranoia with epiphanies. I just pulled it down, 1972: had to scroll like FOREVER through their catalog to get to that. Yep. It’s a vast and rich discography. I posted on TD a number of times and only scratched the surface. Let me know what you think. This was fantastic. Love the variations. Thanks Aaron. We do love our album cover art round here! I couldn’t tell! Hahaha Seriously though, I love these posts. Keep ’em coming!